It is that special time of year; the rut, the mating season of ruminate animals. This is when local mammals, such as deer and moose, start to act a little crazy. This romance-inspired reckless behavior seems to be hitting the moose species especially hard this year. 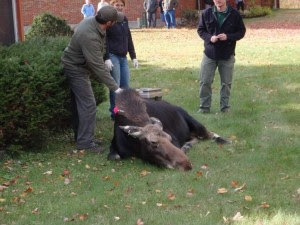 Off-hours calls to the homestead have increased and the resident biologist just did another forced relocation of a cow moose. More sad news arrived this morning with the call that a cow moose was struck and killed last night near Exit 24 on Interstate 87, the Adirondack Northway. Fortunately for the human species, the vehicle involved last night was a tractor trailer truck, so the truck won and no one was injured. It is really cool and fun to see moose in the Adirondacks. Be advised, however, hitting a moose at Interstate speeds in a normal sized car, or even in a big fat Suburban from Jersey, could cause serious injury or death to those in the vehicle. And that would be neither fun or cool.